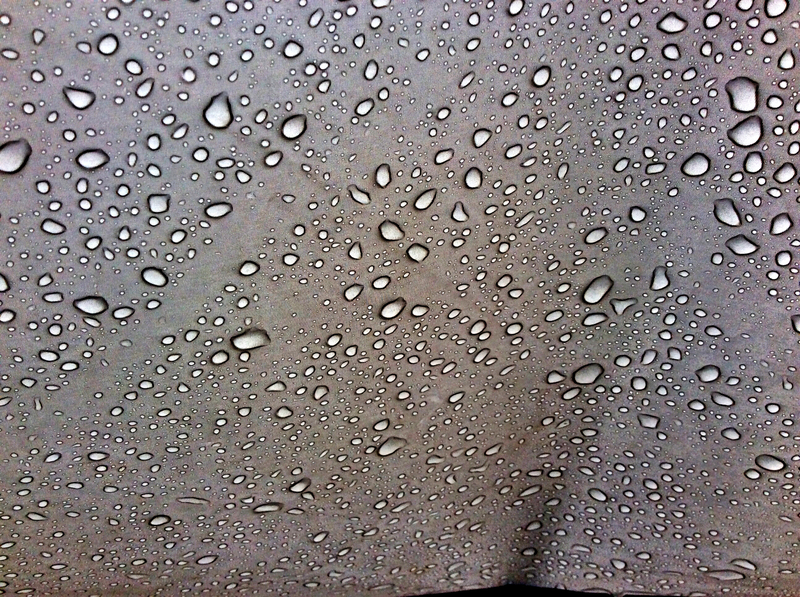 After yesterdays clear blue skies and hot, this morning was heavy overcast and very light rain. 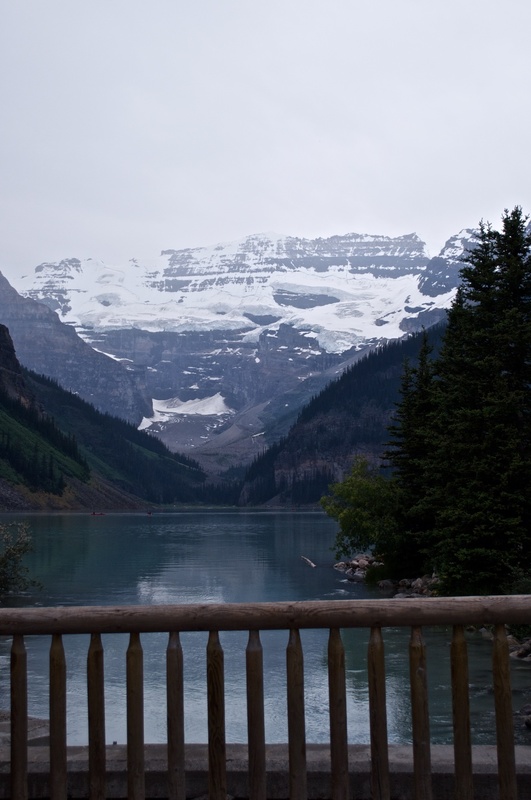 After quickly packing up the camp before things really got wet, I headed for Lake Louise. Here is the poor view of the lake from a small bridge by the hotel. Like many other locations within Banff, this place was overrun with tourists and enough cars to justify parking attendants. After taking a few photos (none of them came out due to the low clouds) I headed out of the parking lot. And the bike seemed noisier than usual and there was quite a bit of "popping" in the exhaust on the right cylinder. Before heading onto the highway, I stopped to investigate and saw this, a broken weld on the exhaust system. 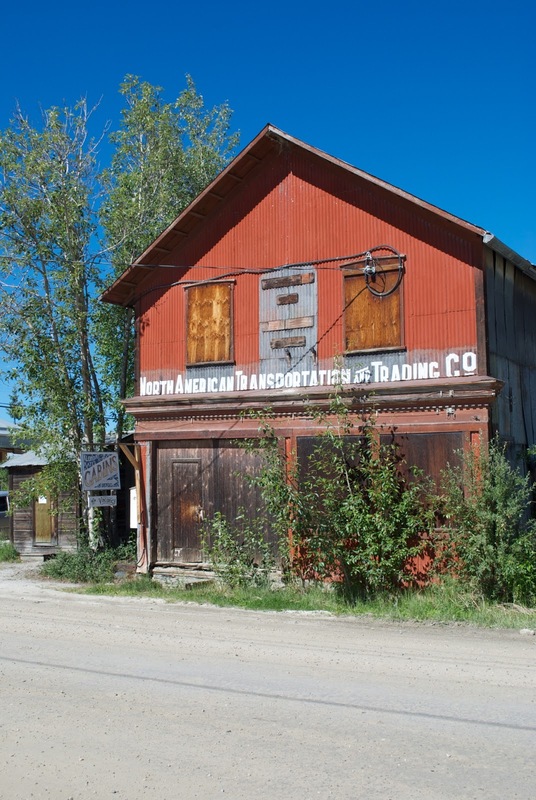 The next town was Golden, BC, and I was directed by the nice folks at the visitor's center to a local iron works shop. I stopped in and they dug around to make sure that they had the correct rod for stainless steel. I removed the exhaust header and they welded it up probably sturdier than the original weld. When I was putting on the mufflers, a bolt for the right muffler clamp broke off and after digging around, I found something that would work. But not good enough. It started to really pour once I got back on the road and between the rain, low clouds (poor visibility), road construction, and tons of traffic, it was pretty tiring. About twenty miles down the road, I heard a "clank". 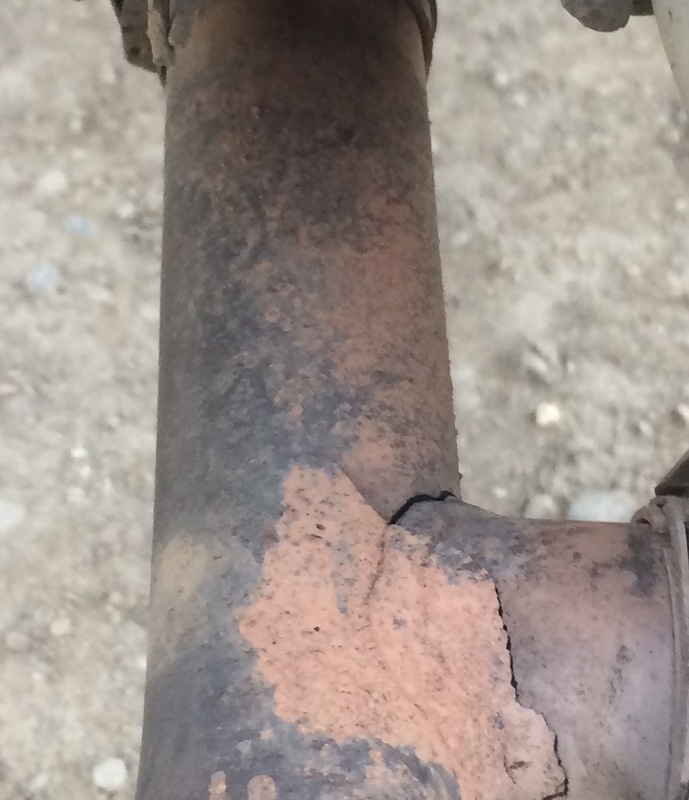 I looked down and saw that my right muffler decided it didn't want to remain attached to the bike. I stopped and eventually got the muffler back from the side of the road but the part where it slips over the manifold was deformed. It probably got run over by someone. Fortunately, I had a hammer and pry bar and eventually had the muffler sort of attached again. Not wanting it to fall off again, I ran a hook from the back to hold it forward. It doesn't slide far enough into the manifold to allow the clamp to actually do anything. But it works for now. A relatively short day today. 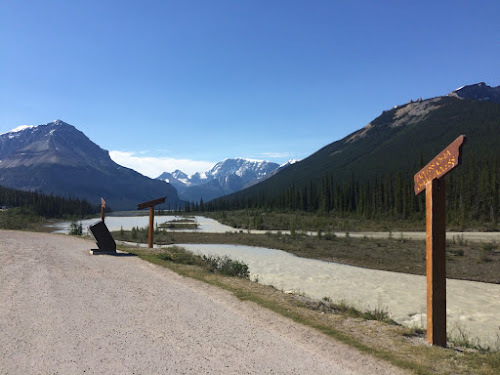 I am about 100 km from Jasper Natl Park and since the weekend here, I decided not to try and find a campsite within the park today or tomorrow. I stopped in McBride for gas, went through the local visitors center and wandered through the local market. I needed to get some groceries, do laundry, etc. so I may stay here for the next couple of nights. 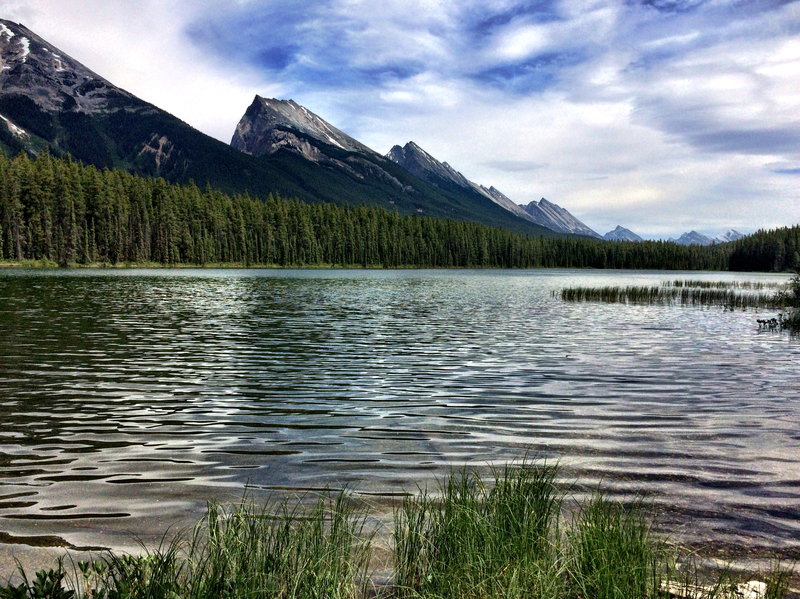 Very quiet location between two mountain ranges. This has been a very relaxing trip though I was concerned about the integrity of the rig while on the Cassiar. Maybe it was the remoteness that contributed to my concern. 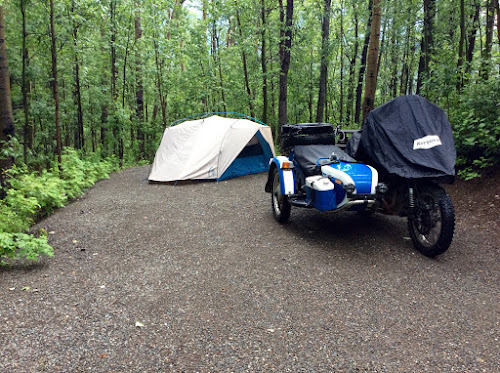 RickS, the Ural rider in Fairbanks whom I bought this rig from, wisely suggested that I move the thermocouples for the CHT (cylinder head temperature) from one side to the other as these gauges aren't known to be very reliable. I had swapped them before but only for a short time as I didn't want to bother re-running the cables and tying everything down. 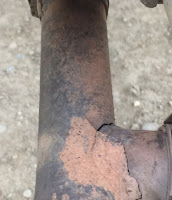 Last night, I did just that and, lo and behold, on todays ride it was now claiming that the right cylinder was running really hot. The left cylinder was registering "expected" temperatures and nothing wierd like it was showing before. By "expected", up to 400°F while cruising at 55 mph and climbing to 425°F when climbing grades. Both plugs were a nice shade of darkish tan indicating that the mixture was not too lean. So thank you RickS for having me check the validity of the tool. So I'm not going to worry about the mixture again. The gas mileage has dropped a bit probably due to the higher speeds along the Yellowhead Hwy and riding through the rain. GPS corrected gas mileage is still above 31 mpg. I'm not complaining about that. And I haven't had to check the valves again. The valve clatter on both sides are sounding the same. The higher speeds does mean that oil consumption is a bit higher but not excessive. So far I've added about 0.7 quart since leaving Fairbanks. Well, not what things looked like at all today. 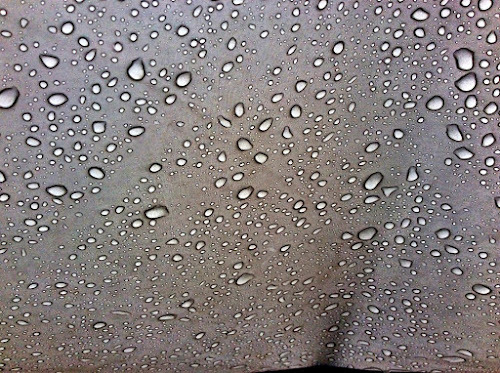 Rain was forecast for most of the day so as it hadn't rained yet when I woke up, I quickly packed up the tent while it was still dry. It started to rain just as I finished packing up the rig while enjoying a cup of coffee. Highway 16 running east to Prince George was a very busy road. I must've pulled over a few dozen times to let other vehicles pass easily. Shortly after the Peterbuilt RV passed me (occuants all waving and honking their horn), two deer jumped across the road and one ran into the side of the front wheel of the Ural. No problem with the rig though the deer didn't survive the encounter. The rig swerved to the right but no problem recovering. I guess it's built pretty sturdy. At the time, I was going about 55 mph. 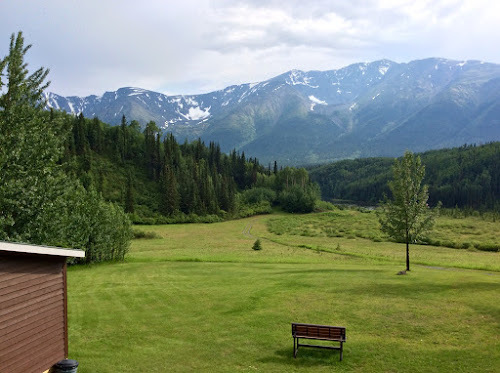 Better wi-fi now that I'm off of the Cassiar Hwy. Both RV parks advertised free wi-fi but it was satellite based and really slow. This is one of the few vehicles that I was able to pass (multiple times). 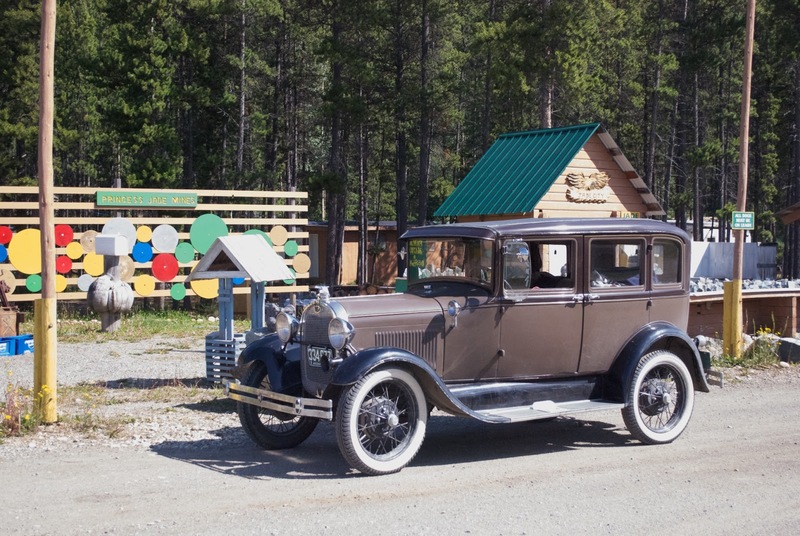 The two Ford Model "A"s are returning to Washington after driving up to Fairbanks. This photo is at Jade City, a regular stop for me since they have free coffee, near the northern end of the Cassiar Hwy. I passed them again this morning at Meziadin Jct. This is a shot from my campsite in Stewart. A pretty nice view though it was pretty overcast this morning. While here, I checked the valves again on the right cylinder not because it sounded loose but because the head temperature on the right side was lower than the left. There are a number of possible reasons for this but I wanted to check this first. Both valves were slightly loose but still within tolerances. But I adjusted them again anyway since I had the valve cover off. On todays ride, the left cylinder temperature was still higher but only at small throttle settings. 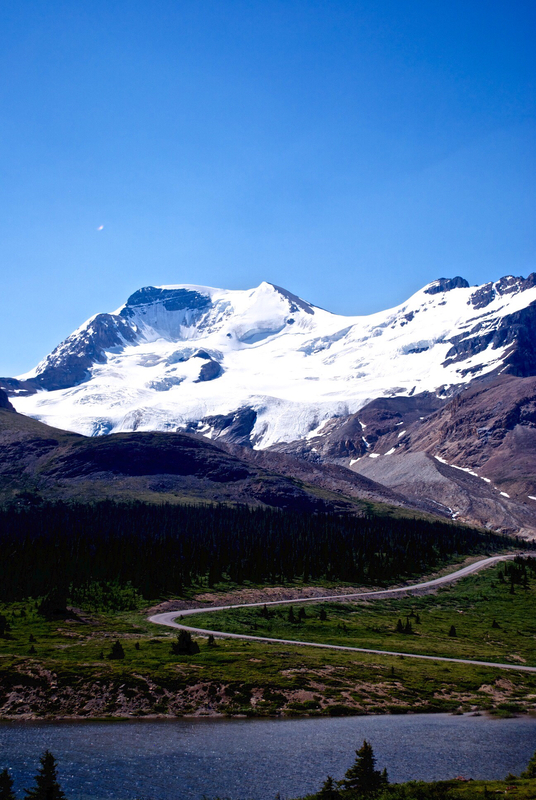 But when climbing a hill or accelerating, both matched pretty well and the temperature dropped. I'll be looking for an air leak this evening. The vacuum operated fuel shut off valve is suspect and there is an easy "fix". 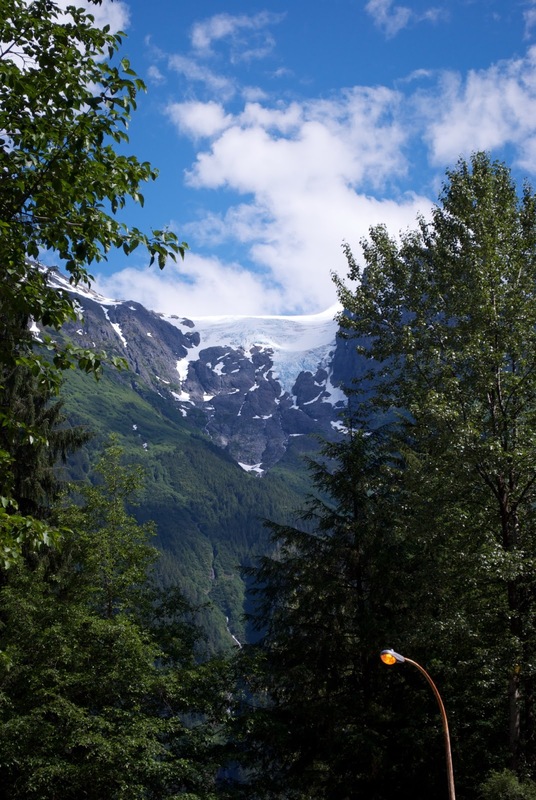 Nice glacier view from the road out of Hyder. Four black bear along the road today and three yesterday. I haven't had an opportunity to check out the GoPro images to see if any of them were captured. I had it set to take a picture every 10 seconds so there are a lot of images. 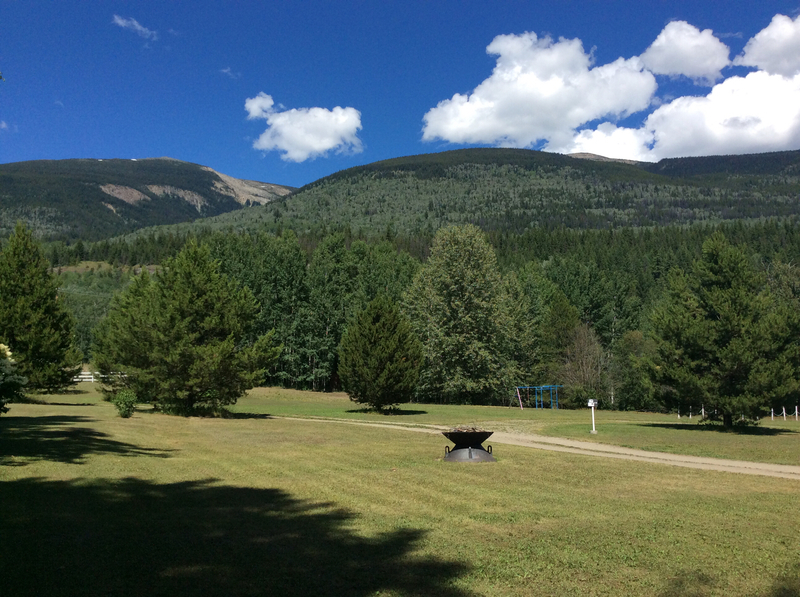 A British couple heading for Alaska in the next campsite recommended a municipal campground in Smithers so that is where I initially headed. It was overrun with kids dressed in strange costumes so I kept on going. 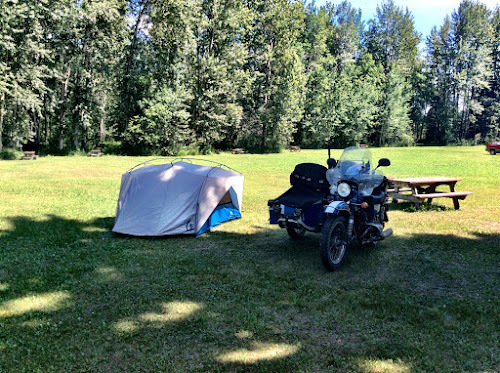 The Telkwa RV park has great wi-fi and they give motorcycles a $4 discount. 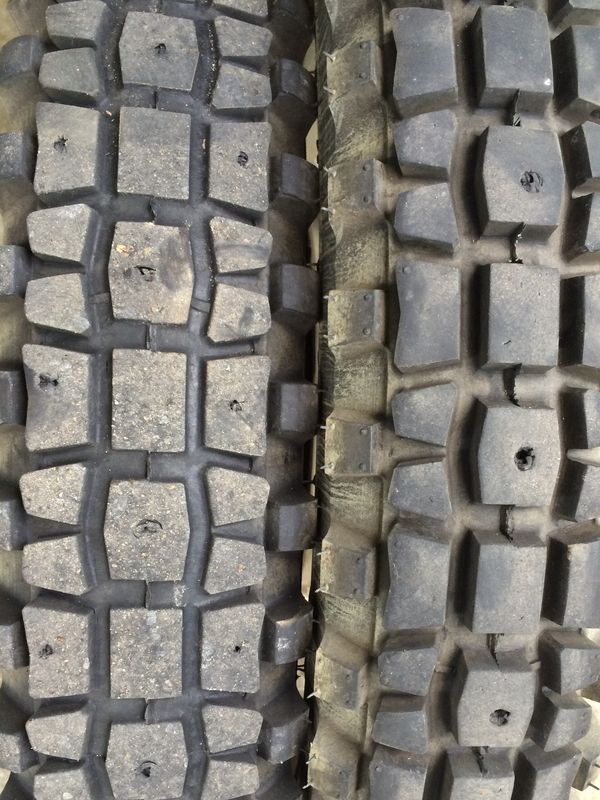 Yesterday, I swapped the new K28 tire for the pusher as there shouldn't be any more chances for muddy roads. I ran into afternoon thunder showers on Sunday and Monday and yesterday was a real down pour. Today, it was all clear and sunny all the way into Stewart. This was a post that was composed but never got sent due to poor Internet. Blue skies without a cloud in the sky this morning and it had warmed up to ~70°F by noon. I am headed down the Cassiar Hwy and was originally thinking about camping in Dease Lake. 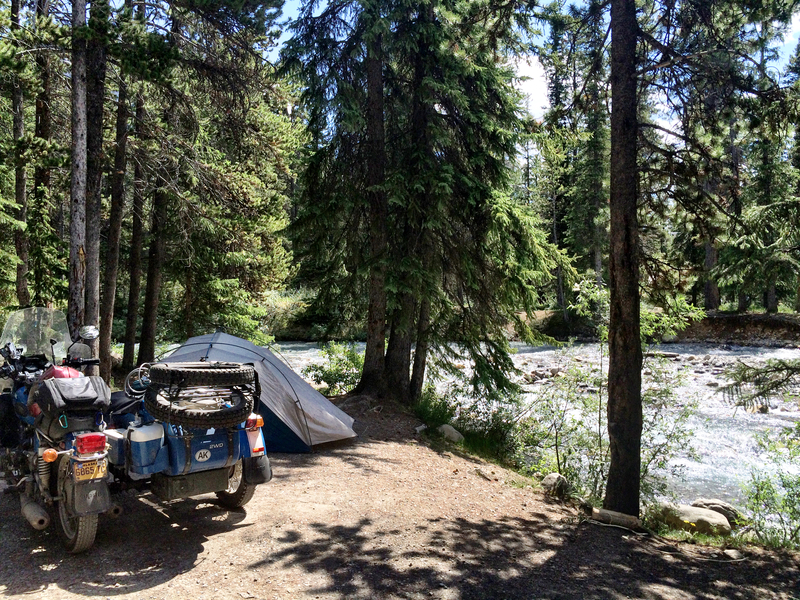 I found the campground and there were a lot of gnats so I kept going. 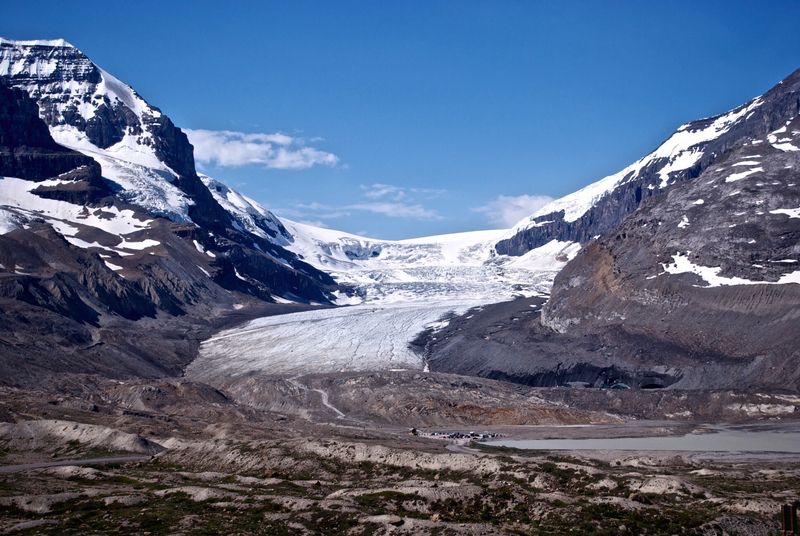 82 km further down the road was the village of Iskut and there was a promising RV park listed in the Milepost. They have nice tent sites with decent showers and, most importantly for me, a flat gravel pad as I wanted to switch from the K37 to the K28 on the pusher. Just as I finished changing the rear wheel, I could hear thunder in the distance and shortly after my shower, it started to rain buckets. Today is one of those days when I really appreciate the new Sierra Designs 3-person tent I had picked up in May from REI. It has an external aluminum frame and the rain fly hangs from it. The tent itself is attached to the rain fly so they both go up at the same time. When packed, it is only slightly larger and a pound heavier than the 2-person Kelty tent I used on other trips. The extra space is nice on this rainy afternoon. It had also rained yesterday afternoon so I am thinking that I may be leap frogging the storm every day. Time to shorten my daily rides. Today was about 220 miles. 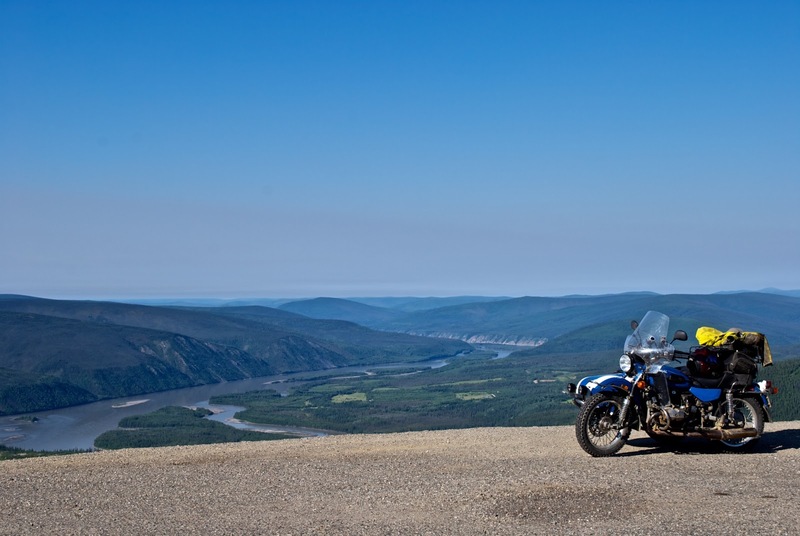 From the north end of the Cassiar Hwy down to Dease Lake is one of the longer stretches without a gas station at 250 km. 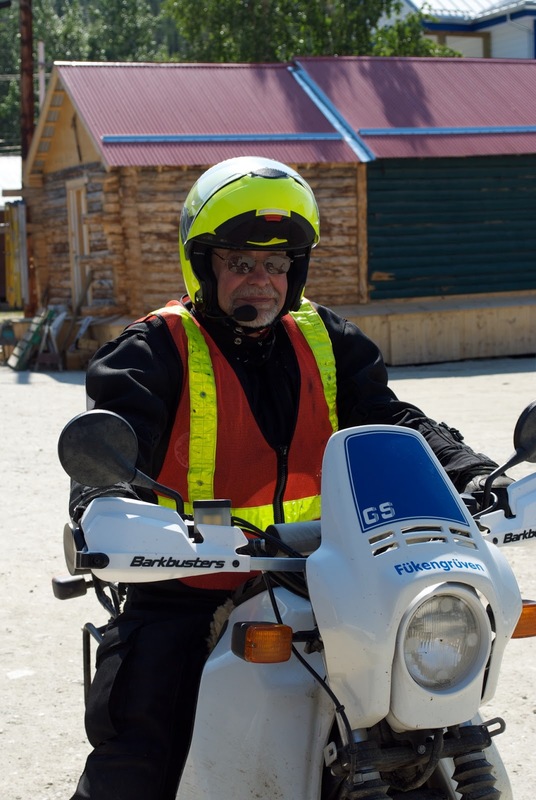 The "norm" on the Ural has been to switch to reserve at 164 km. I had an extra 2.6 gallons of gas so I wasn't concerned about running out. I didn't need to switch to reserve until 207 km (indicated) and reached Dease Lake at 228 km (indicated) so my actual range is a lot further than I thought. Not just from better gas mileage but from the odometer error as well. Today's riding goal was Nugget City, actually, that's just the name of the RV park that is at the upper end of the Cassiar Hwy. About 250 miles from Whitehorse. I've stayed here before and the wi-fi was decent. Plus, it will give the rain a chance to pass me by. It rained yesterday evening a little bit in Whitehorse and I went through it again (with hail) around the continental divide. Once I arrived here, I sat in the restaurant having coffee while the storm caught up with me and dumped quite a bit of water. 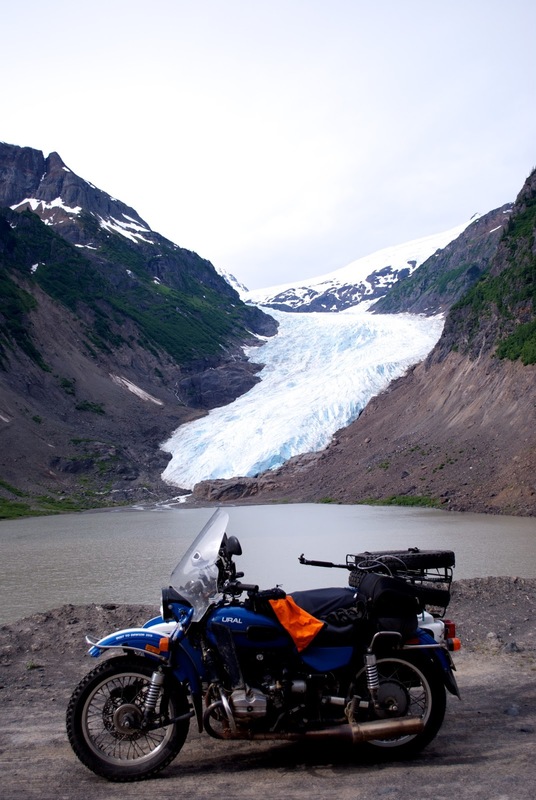 Hopefully, tomorrow, it should be nice and clear again when I start south on the Cassiar. The picture is of the bridge over the Teslin River. 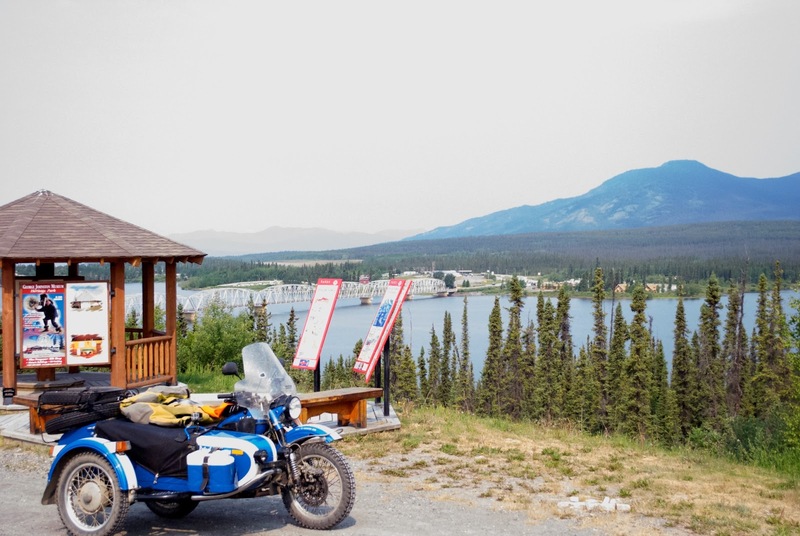 It has some notoriety among moto travelers as the longest steel grate bridge on the Alaska Hwy. Some have been known to turn around rather than ride across the bridge. 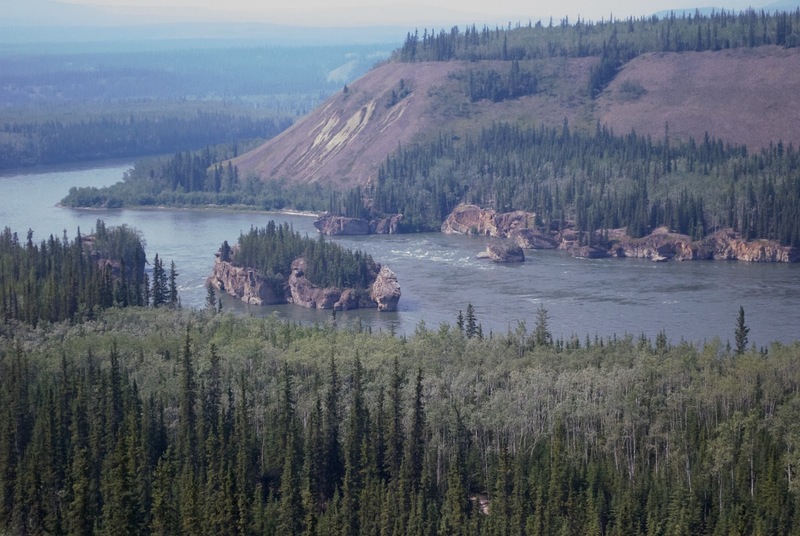 This is a very smoky shot of Five Finger Rapids just north of Carmacks on the Klondike Hwy. 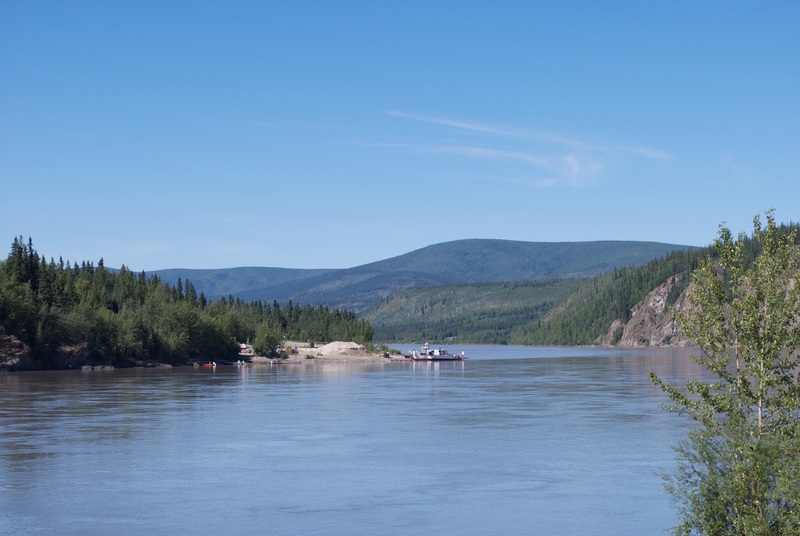 It was a real navigation challenge to those heading up to Dawson City. It was a hot 80°F on Saturday. Not so warm today especially when it was hailing. Here are just a couple of pictures from the bike rodeo at D2D. This is fellow Fairbanks airhead Steve trying the blindfold ride. They have to aim, ride and stop with the front wheel as close to a paper plate lying on the ground. He had a bad start as you can see he's starting to turn to the left towards the spectators. And, yes, he is wearing a helmet under the cover. This is an Anchorage rider dropping tennis balls into containers on the ground. 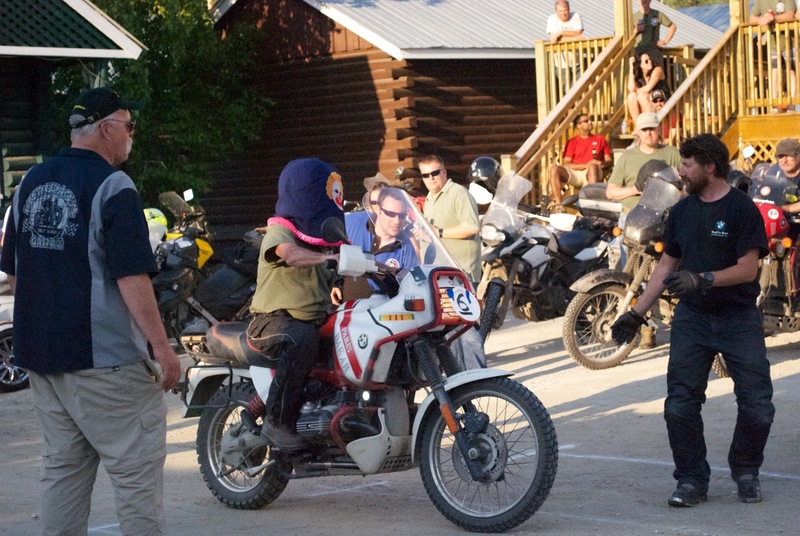 They say that there were about 300 riders in attendance and for the first time, the Canadian attendees out numbered the U.S. attendees. Today ended up being a long day, 354 miles. My daily mileage goal was about 200 miles and after filling up in Carmacks, YT, I started looking for a camp site. 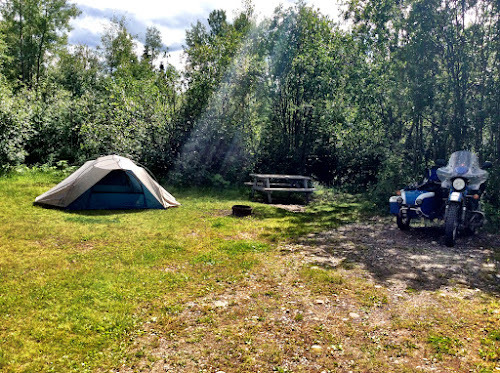 It being Saturday, every campsite in all of the provincial parks between Carmacks and Whitehorse was taken. 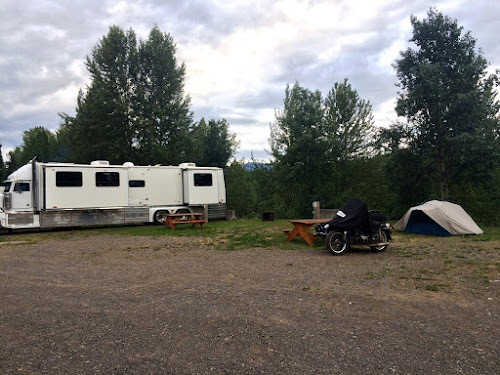 I finally stopped at an RV park in Whitehorse. Two black bear on the road today. Tried video but I don't know how it came out. I'll post more pictures when I have more wi-fi. 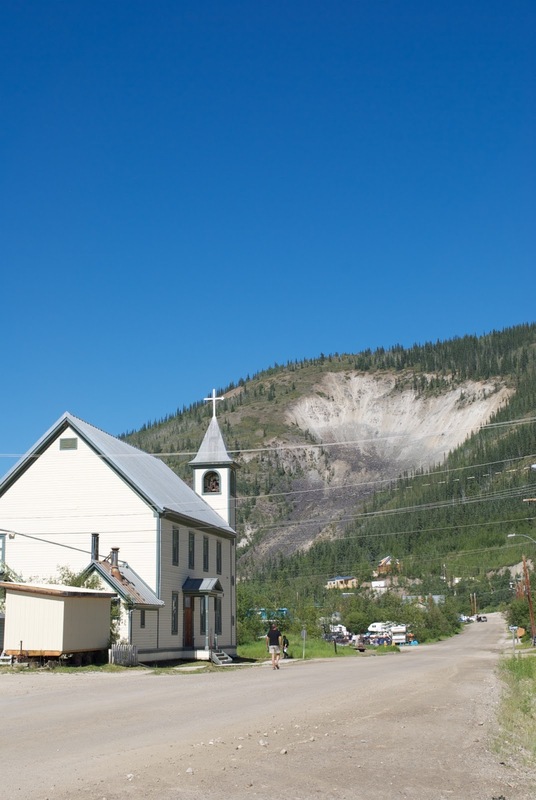 I did a little bit of wandering around Dawson City. The large white area left over from mining is used to identify Dawson in a lot of old photographs. This is on the street down from the B&B that I'm staying in. The central place for the D2D (Dust to Dawson) is at the Triple J hotel very close to this. Most of the streets are dirt with the exception of the main drag along the waterfront. Just one of the many old buildings in town. Many of the shops that were here the last time we were in Dawson have closed up including the gift shops along the waterfront. I didn't think that this place was suffering too much from the reduction in tourism following high gas prices but maybe it has. 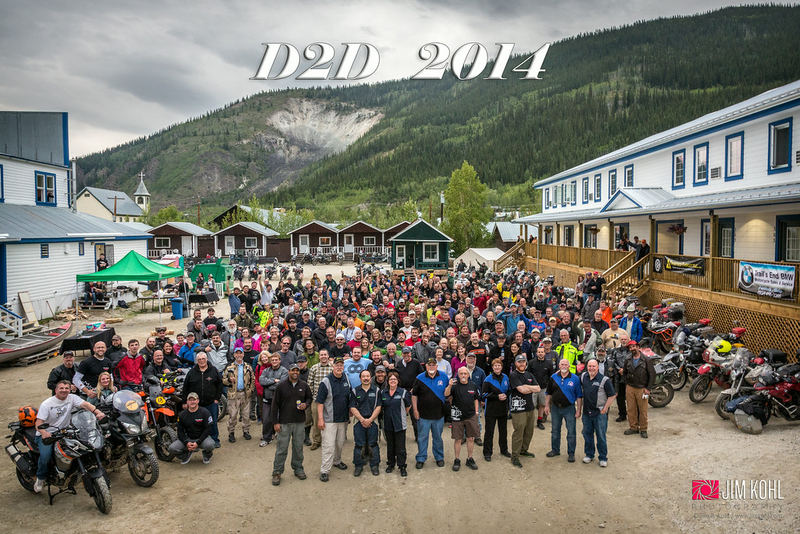 I'm told that events like D2D really do bring more money into town than some of the organized tours. I was surprised to see 737 flights coming into the airport but I'm told that tour companies run one way trips to Dawson as many tourists don't want to travel the gravel roads both ways. This morning (Friday), I rode up to the top of Midnight Dome, which is going to be a real popular place in a couple of days as the claim is that you can see the sun for 24 hours from there. 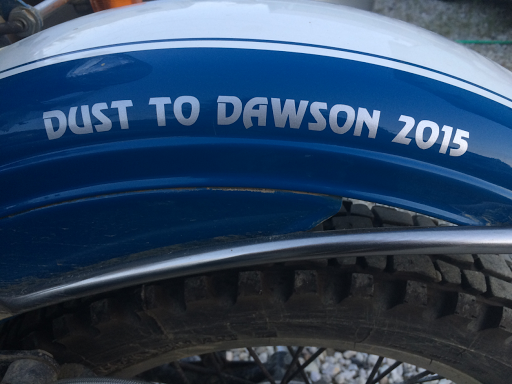 Dawson isn't quite close enough to the Arctic Circle for that but it makes a good story. This is looking towards the west and you can see the smoke from the fires in Alaska. I'm afraid that it may be a really bad fire season in Alaska. 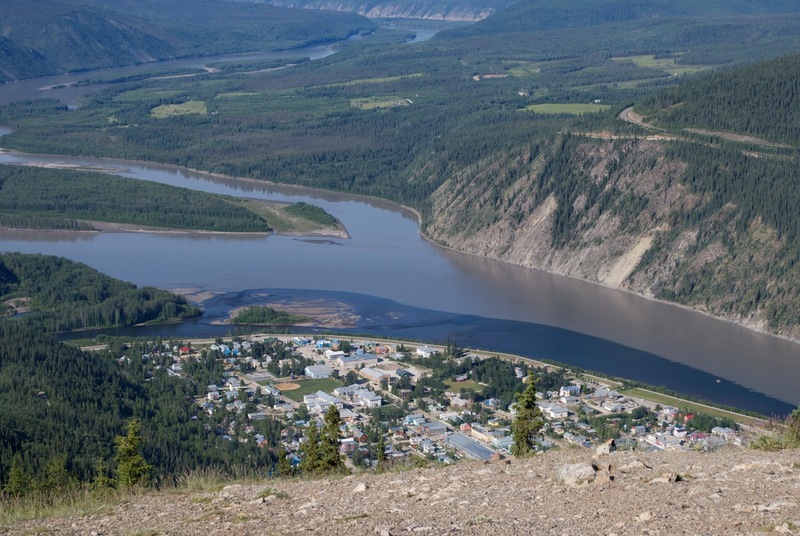 This is looking down at the two rivers coming together with the clear water of the Klondike River mixing with the sediment filled waters of the Yukon River. The dark is the Klondike River water. I'm not sure how far down river it will stay distinct like this but I suspect that there must be a Wikipedia article about it. 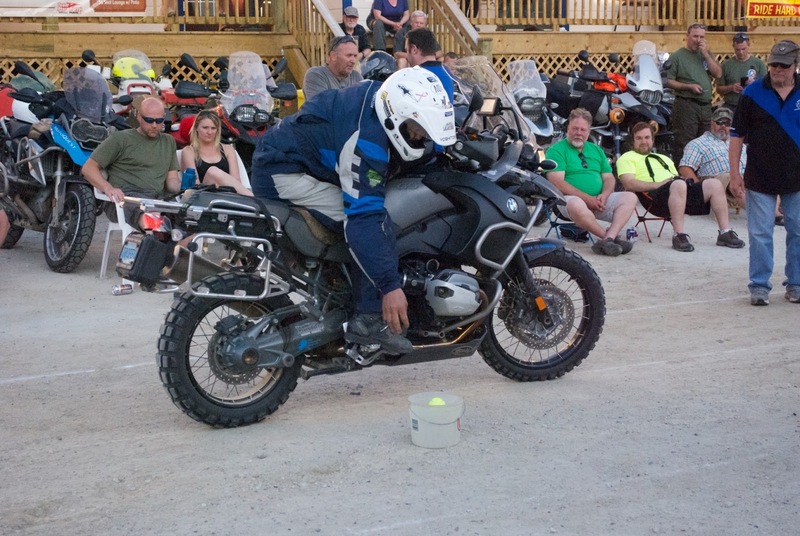 This is BobC from Fairbanks on his R100GS getting ready to leave on the poker run. 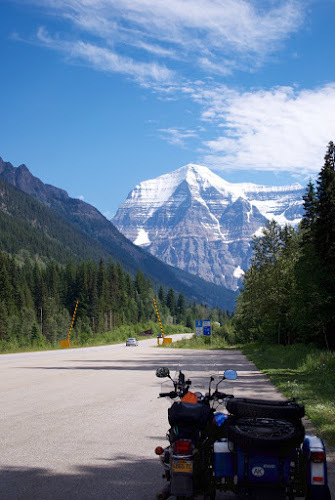 He arrived in Dawson on Tuesday making the ride in a single day. I don't think that I would be able to do that with the Ural. 300 miles seems to be about the limit for "reasonable". Steering takes a lot more effort than on a solo bike. I figured that I didn't need an additional 80 miles on the clock and just relaxed and talked to other like minded folks. Some treat the poker run as a race. This evening are some "bike games". I'll include pictures of those events on my next post. The group photo is scheduled for midnight tonight. This morning the valves sounded a little noisier and both of the right valves were about 0.002" loose. Hopefully not an indication of a problem. Plus I needed to add 400 ml of oil to the engine after only 623 km. Also something to watch. On the Taylor and Top of the World highways I spent a lot of time in 2nd and 3rd gear with the engine running at higher RPM. It's something that I need to keep an eye on. Left mid morning from College Coffeehouse as you can see with all the video that Bridget posted. Filled up in Delta and arrived at my first stop at Tok, AK. Originally, I was to meet Jeff from Wasilla here but he had to cancel due to a memorial service of a close friend. 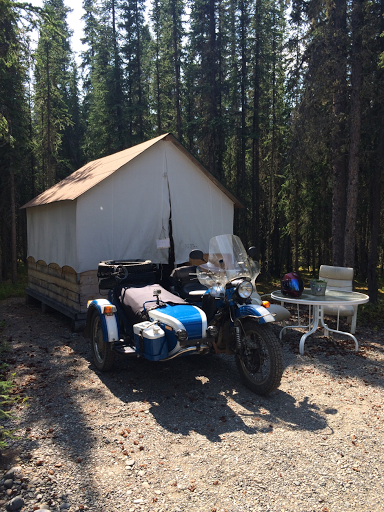 He had reserved this nice wall tent at Thompson's Eagle's Claw Motorcycle Park just a short ways south of Tok. He transferred the reservation to me after he had to cancel his trip. Pretty deluxe and a nice way to start the trip. 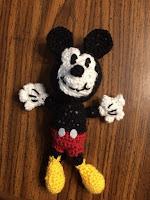 No wi-fi so just a short post. I made Richard a Mickey to ride along with him since I couldn't go all the way. Here is Richard leaving. On his Way!!!! All packed up and ready to head out tomorrow morning. 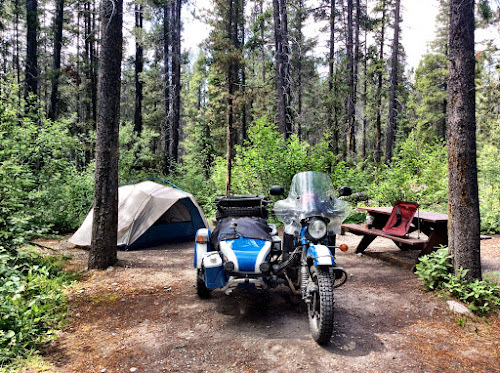 All of my stuff including camping gear fit easily in the sidecar with room to spare. I even have a small ice chest and half gallon water jug on the sidecar seat. The tail bag has the things that I wouldn't want to leave out such as medications, cameras, etc. Kind of like when I was commuting. The only real thing that stands out is the extra tire tied onto the rear rack and the two 10 liter gas cans. Generally only the rear can will be used as the front one adds weight in a less than desirable location. There are only a couple of times when the distance between gas stations is far enough when both will be needed. Even though I had told myself to stop messing around with things on the rig, after much thought, I switched back to the stock air box. An 8,000 mile trip is probably the wrong time to test the durability of the design. This necessitated a slight change in the carb jetting to compensate for the more restricted flow. The following information is so I can keep track of what is currently installed. The GoPro and it's remote are running off of bike power so it should be easy for me to punch the record button anytime I see something worthwhile. For the next month, I'll be relying on campground wi-fi so posting may be somewhat irregular but the intent is to post every day. There is a link to my Spotwalla page on the upper right though it won't show any data points until tomorrow (hopefully). 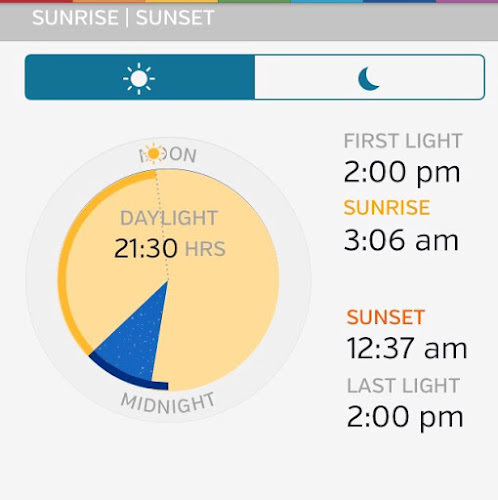 We are approaching the summer solstice and the Weather Underground app has this cool graphic that shows not just hours where the sun is above the horizon but also first and last light. Currently, they are both stuck at 2:00am. In some ways it almost looks like summer though this mornings 45°F temp did have some wondering if they missed Summer. I had a lot of errands to do this morning and at the hardware store, there was a German tourist looking at the Ural. It turns out that his as an R100T and was thinking about putting a sidecar on it somehow. 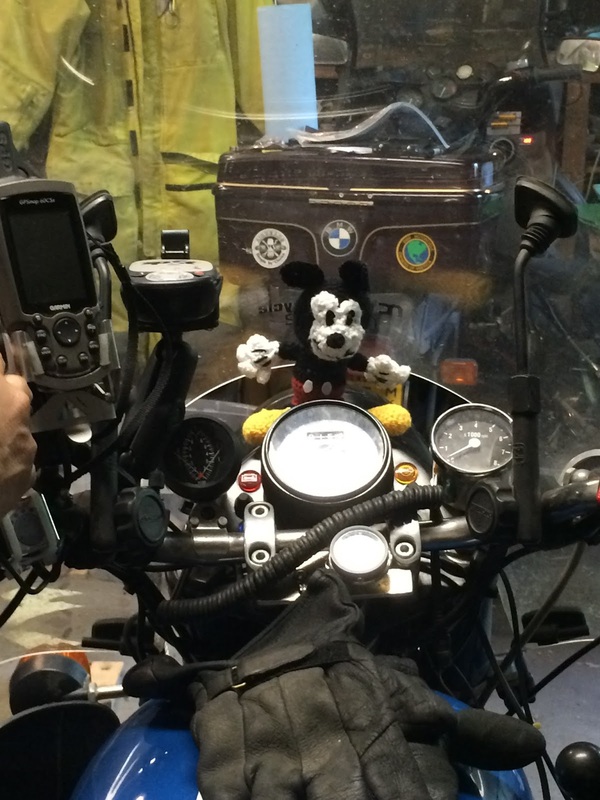 He prefers being able to go more than 100 kph (62 mph). That UDF was about 15 minutes. I was at the hardware store to pick up a couple more 3mm stainless steel washers (hard to find) to raise the carburator needles up a little bit more. The needles control the mixture at mid-throttle and I would occasionally get a little bit of "popping" while just cruising down the road. I had told myself that I need to stop messing around with the rig and just get ready to go so I'm not sure I'm going to change things. If I get more popping while on the trip, at least I have the option to add them. The one thing that I probably should do it to switch the pusher with the sidecar tire. Compared to the sidecar tire, the pusher is pretty worn and this way I'll be starting the trip with an almost new rear tire. I want to leave on the mud tire as I initially will be heading for D2D. D2D, aka Dust To Dawson, is a moto non-rally that really only exists on the Alaska regional forum on ADVrider.com. Their definition of "non-rally" is that no one is in charge and no one is charging you to attend the event. They still have a schedule of events, a dinner, and t-shirts though you have to pay for all those things individually at the non-rally registration tent. As long as it isn't raining, the Top of the World Hwy should be in pretty good shape. It has been a muddy mess in the past. This is last years group photo taken at midnight. Friday Evening Update - Here are the two rear tires, the sidecar one is on the right and the pusher is on the left. You can see why I swapped them. 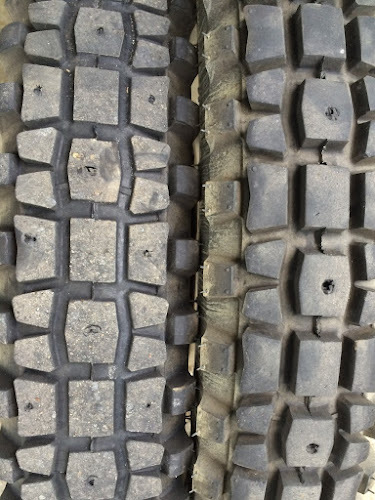 Both of these tires have almost 10k km on them or about 6200 miles. Tire life isn't as bad as I had been expecting. I had mentioned the special tool that one of the SovietSteed members had come up with. Since I was switching wheels I needed to readjust the brakes especially on the pusher. 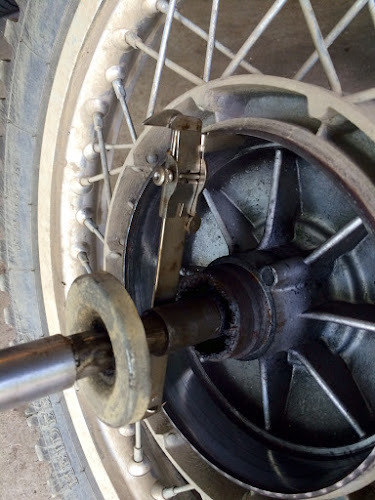 The first step is inserting the axle through the tool and through both wheel bearings. 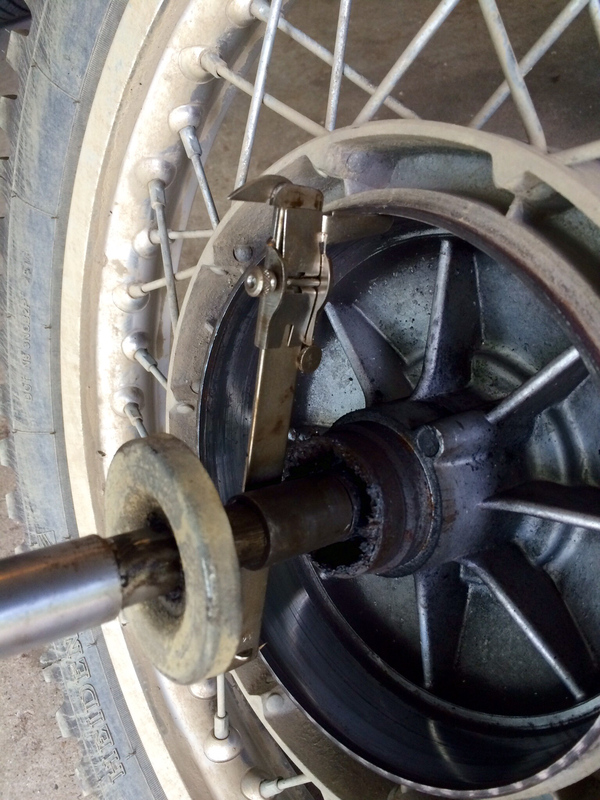 then set the caliper to the diameter of the inside of the brake drum. Then remove the axle and tool being careful not to bump the caliper. 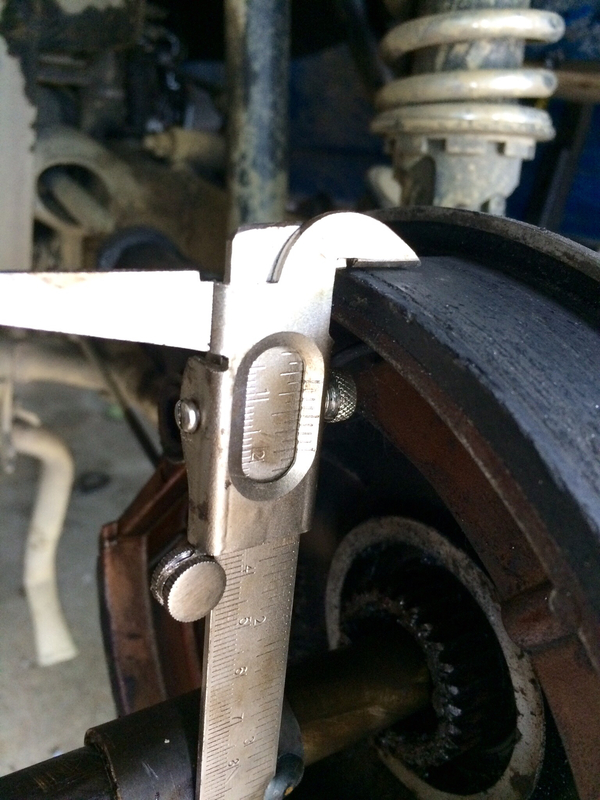 Then install the axle and tool and using the other side of the caliper, measure the brake shoes. With the adjustment nut near the loose end of it's range, adjust each brake shoe so that it barely touches the caliper. Once both shoes are adjusted, remove the brake adjustment nut, put a little bit of high moly grease on the hub spline and install the wheel. And just because I could, I readjusted the wheel bearing (it didn't need it). Then just tighen everything up. At the auto parts store, I found small tubes of high moly grease. These small tubes fit the small grease gun that I've had lying around for several years and will go on the trip. Like the bottles of oil, it'll ride in the ammo can installed under the sidecar trunk.